Ko Haa’s white-sandy beaches, stunning karst islands, crystal clear waters, shallow lagoon and beautiful reefscapes make this site a photographer’s dream and is one of the best macro sites in the area. The 12+ dive sites at Ko Haa offer beautiful scuba diving and snorkelling with spectacular visibility. Diving at Ko Haa is suitable for divers and snorkellers of all levels. 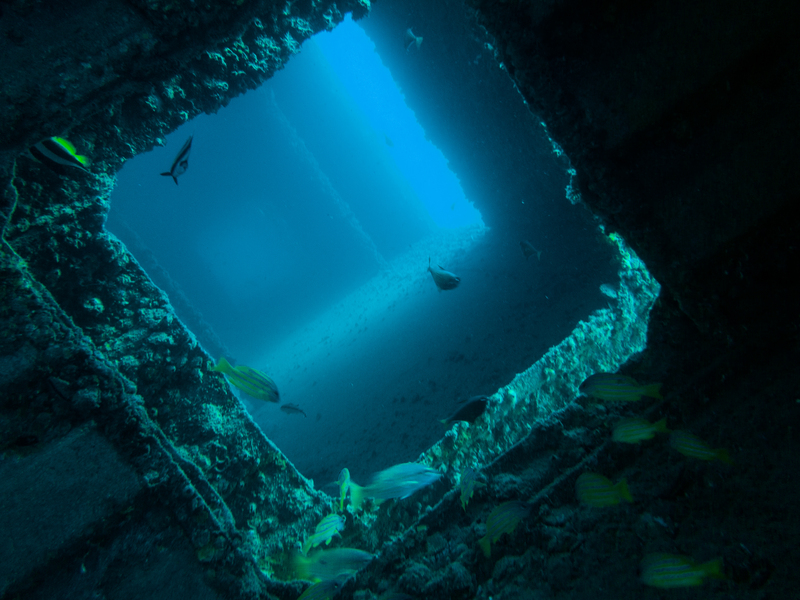 Ko Haa’s scuba diving highlights include The Lagoon, The Cathedral and The Chimney. There are also underwater pinnacles, drop-offs, walls, boulders and other caverns, inter-connected chambers and swim-throughs to explore. Ko Haa, which means ‘Five Islands’ in Thai, has a central lagoon area that is ideal for beginner divers It offers a safe and relaxed starting point for you to take your first underwater breaths and there are some extremely friendly little Porcupine Puffer Fish, ready to make your acquaintance in the large, sandy bay area. The bay slopes gently onto the reef allowing you to progress into your first dive effortlessly. The marine life that can be found at Ko Haa varies from rare Ghost Pipefish measuring only a few centimetres, to an abundance of Octopus hiding amongst the rocks and crevices. A Hawksbill Turtle is often seen swimming amongst the pristine coral. Marble Rays, Eagle Rays, Whale Sharks and even Manta Rays are spotted here occasionally. You can’t predict exactly what you’ll see but it’s always a pleasant and rewarding surprise ! The crystal-clear waters and consistent visibility of 25m+ make Ko Haa an unforgettable scuba diving and snorkelling destination. We keep group sizes small to ensure you get the most out of each fun dive and this also reduces impact on our reefs. Our emphasis is on safety, fun and personal service within a relaxed and stress-free environment. You will find the atmosphere and service on our dive boats beyond anything you have experienced before. We know the dive sites extremely well and are happy to discuss what you would like to see and the type of dive or snorkel experience you would like to have. Each dive is personally planned with the divers in each group to ensure you enjoy every dive you make with us. A full briefing is provided before every dive with helpful tips on what to look for and safety information. The two sister-islands of Ko Rok are best known as the top snorkelling sites around Ko Lanta. 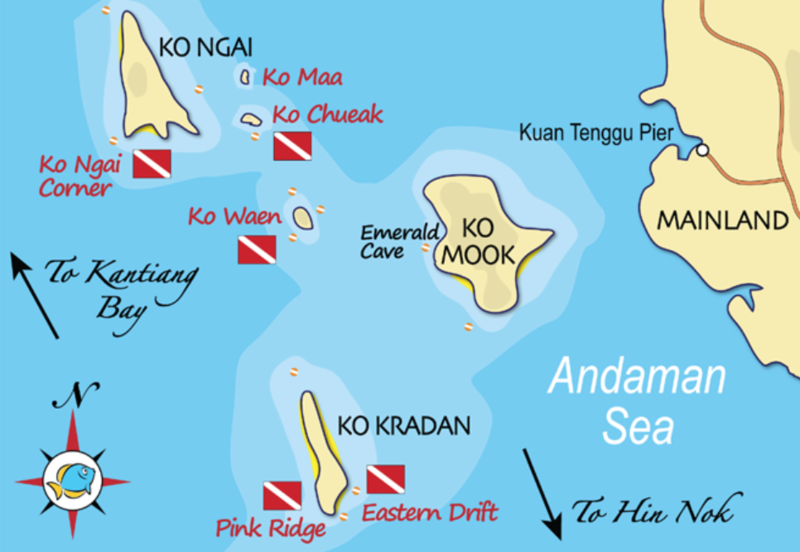 Our location in the South of Ko Lanta gives us great access to these little known dive sites. The islands are quite large and we are still discovering new and exciting dives. Enormous gorgonian sea fans, huge hard coral formations and many colourful, soft corals, dominate the deeper areas on the east side of Ko Rok Nok. There is a blue hole at Ko Rok evidence of a high level of healthy coral growth. As newer corals grow over a very old reef, the weight eventually causes the reef to collapse in on itself causing a blue hole. Located about 22 km west of Ko Lanta, the Phi Phi Islands offer consistently good diving, all year round. Phi Phi is best known for its fabulous Sea Fans and as home of the Leopard Sharks and Black Tip Reef Sharks. With long caves, dramatic overhangs, walls that go down to 30 m, swim-throughs, submerged pinnacles and a fabulous display of hard and soft coral, the diving around Phi Phi is varied and spectacular with something new on every dive. 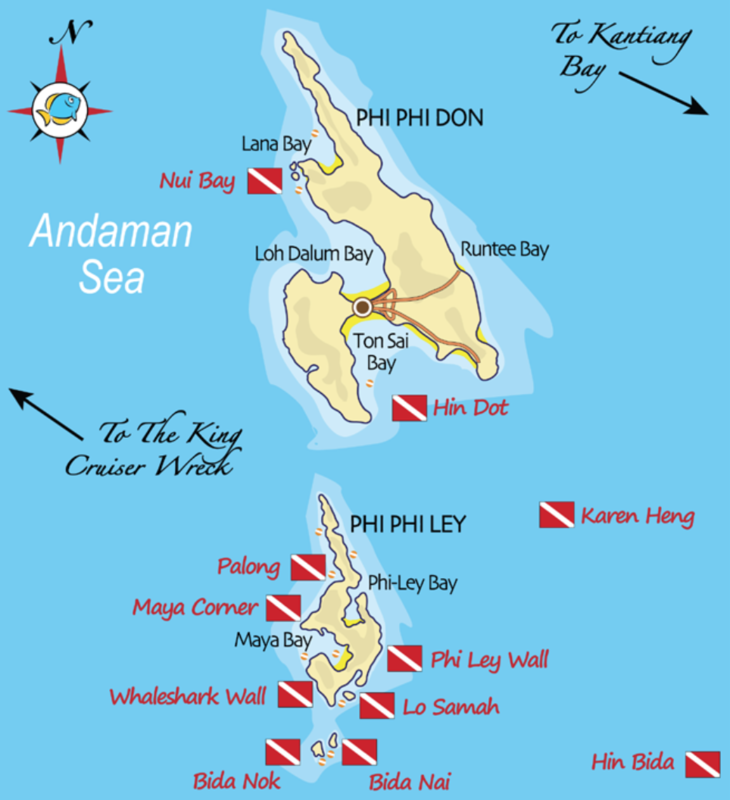 Bida Nok, Bida Nai and Hin Bida are considered to be the premier dive sites of Ko Phi Phi. Whilst the visibility tends not to be as good as at Ko Haa and Ko Rok, these sites are home to such a huge concentration of marine and coral life that divers tend not to even notice and sometimes it’s hard to know where to look ! Phi Phi is best known as home of the Leopard Shark. These docile, nocturnal creatures can be found lying on the sand facing into the current; they are one of only four species of shark that doesn’t need to keep swimming in order to breathe. They like to eat sea urchins, crustaceans, small fish and sea snakes. Hin Daeng is the deepest drop off in Thailand, droping down to 70+m on the southern side, and is named after the beautiful red corals that cover the pinnacles. Hin Daeng is considered to be among the best dive destinations in Thailand’s and is often has the greatest number of Manta Ray and Whale Shark sightings. Located 70km south of Ko Lanta, Hin Daeng boasts good visibility, unless the waters become extremely plankton-rich. It is this plankton that attracts the larger marine-life and keeps everything so nourished. Swim with huge schools of barracuda, rainbow runners, travalies, red-tooth triggerfish and batfish. Hin Muang is completely submerged and derives its name from the vast number of purple corals covering the pinnacle. It is also known as a cleaning station for passing Manta Rays who come here to be cleaned and use neighbouring Hin Daeng as a navigation point. The reef is 230m long and less than 20m wide, and comprises three main pinnacles and several smaller ones. In the main central channel, reef fish congregate to escape the currents that sweep along each side of the reef. At Hin Muang and Hin Daeng, the marine-life seems to be on a larger scale than anywhere else in the Andaman Sea. The Southern or Trang Islands are a group of 6 limestone islands located 1-2 hours south of Ko Lanta. The absolute highlight of this trip is the chance to explore the Emerald Cave a secret lagoon hidden inside the island of Ko Mook. The only way in, is to swim 80m through a tunnel that opens out from total darkness into a secret bay with limestone cliffs soaring high above you on all sides. It’s a truly amazing experience to emerge from a dark tunnel into a stunningly green tropical paradise, complete with large white-sandy beach. You can’t help but imagine what it felt like to discover this, almost film-set like place, for the first time and to imagine the pirates and smugglers who used the cave as a secret hide-out in times gone by. 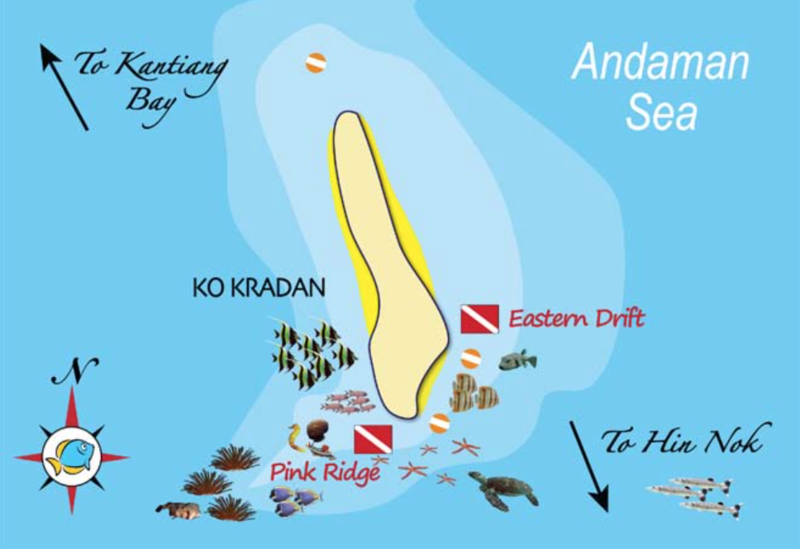 The Islands of Ko Waen, Ko Chueak, Ko Maa and Ko Ngai offer sheltered diving that can be a good alternative if the sea is too choppy to reach Ko Haa or for divers looking for macro/muck diving sites. Mermaid statues, sunk as an artificial reef at Ko Waen provide an interesting backdrop to the colourful macro-life that inhabits these shallow reefs. Swiss-cheese swim-throughs are suitable for more advanced divers. Ko Ngai is a popular snorkeling destination and is a good spot for finding Turtles and schooling reef-fish. 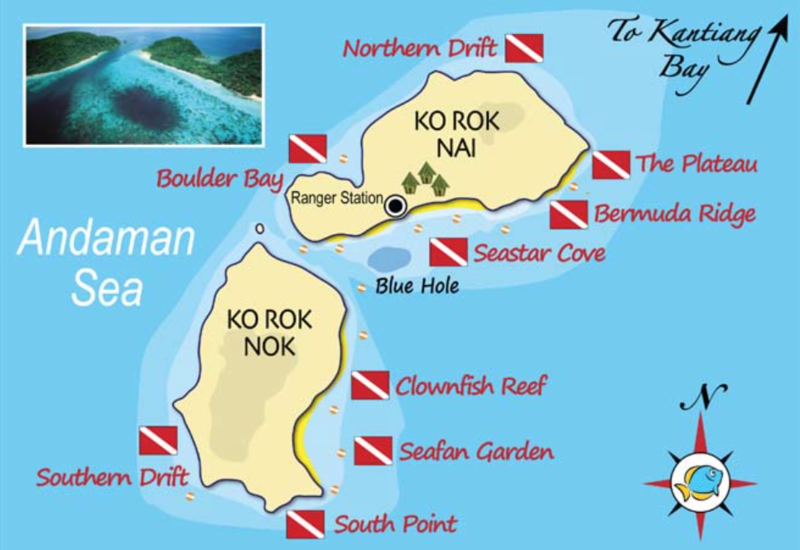 Ko Maa & Ko Chueak are much smaller islands that offer colourful corals at shallow depths. Ko Kradan lies within the Trang National Marine Park and is reputed to have some of the prettiest beaches in Thailand. San Chompuo or ‘Pink Ridge’ is a very different dive to the other sites we visit and has many kinds of coral, starfish and seahorses not found at our other sites. Schooling Moorish Idols patrol these virgin reefs and there is an abundance of lionfish, unusual nudibranches and moral eels to be found hiding amongst the coral. The visiblity is quite variable and tends not be as good as at Ko Haa or Ko Rok, but there is plenty of macro-life and all sorts of unusual marine life to discover. 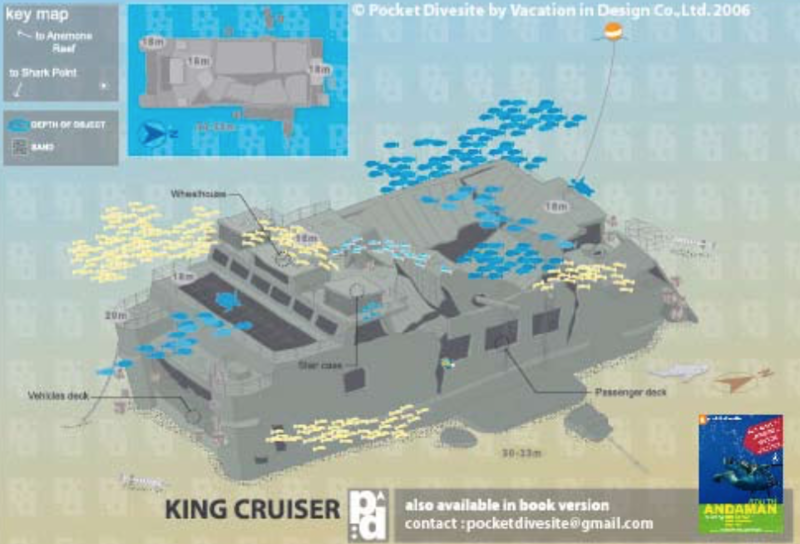 The King Cruiser is 85 m long by 35 m wide, and has four decks with large walkways and windows. 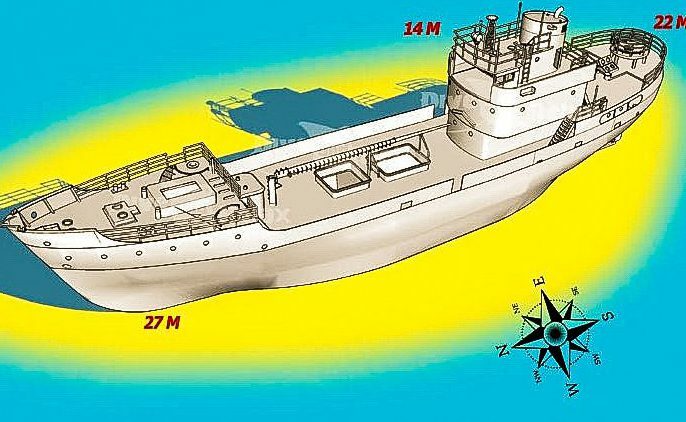 The wreck lies perfectly upright at 32 metres, with the captain’s cabin at 12 metres and the main deck at 14-19m. On May 4th, 1997, the steel catamaran car ferry hit Anemone Reef and quickly sank. All the passengers were safely rescued by nearby dive and fishing boats. The wreck has evolved into a fantastic natural reef and is home to a huge variety of marine life. The depths, together with frequent strong currents, makes diving here unsuitable for beginners. Look for huge schools of fusiliers, snappers and travellie that cover the reef. Shark Point ‘Hin Musang’ & Anemone Reef have some of the most abundant and colourful soft corals in Thailand and are home to literally thousands of marine species. Leopard Sharks are often found on the sandy bottom and look for unusual and rare moray eel species. The currents that sweep over the top of these sites bring plenty of nutrients, and may explain the abundance of fish species considered rare on other Thai dive sites. Look for Orange-Spine Unicornfish, and many juvenile fish sheltering among the soft corals. Spot the pair of Tigertail Seahorses who’ve made their home on the main pinnacle. Amazing wreck diving on this 48m long gunship used in past by Royal Thai Navy as Auxiliary – Gun Ship. Kled Gaeow was sunked on purpose, as an spot for divers. It lies on sandy bottom. Deepes point is at 26m where the propellers are. Main deck is at 19m and the flybridge is at about 16m. Penetration is possible for experienced divers holding Advanced or Deep Diver Certification. Dive light recommended. Three, purposely sunk trains on 3 rails with signpost in the middle to remind Trang town train station. These three parallelly situated trains – carriages with one engine car are about 500m southwest from Ko Waen Island. The deepest point is 18m, so this place is suitable for Open Water Divers. This wreck attracts huge schools of fish and also stonefish, nudibranches and stingrays can be found. Very interesting dive attractive for photographers. Visibility varies. 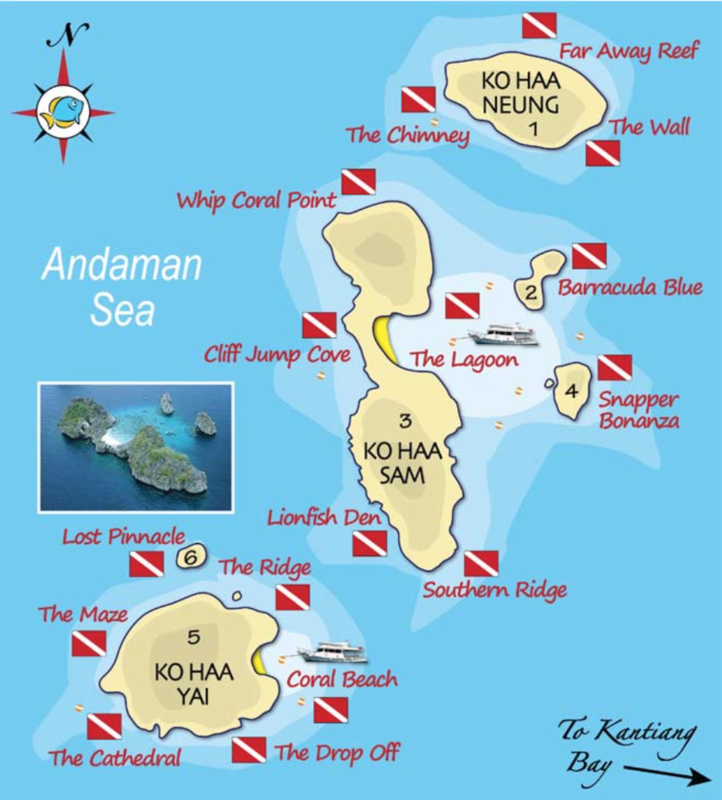 All these amazing places for scubadiving and snorkelling are too far away to be reached in one day. We visiting these destinations while on our Dive and Sail Safaris. Itinerary, places to visit and length are flexible. We can suggest the most suitable locations depending on the level of divers experience or snorkellers and plane the trip regarding your wishes. We always thrive to provide unforgettable experience and dream holiday for our clients. 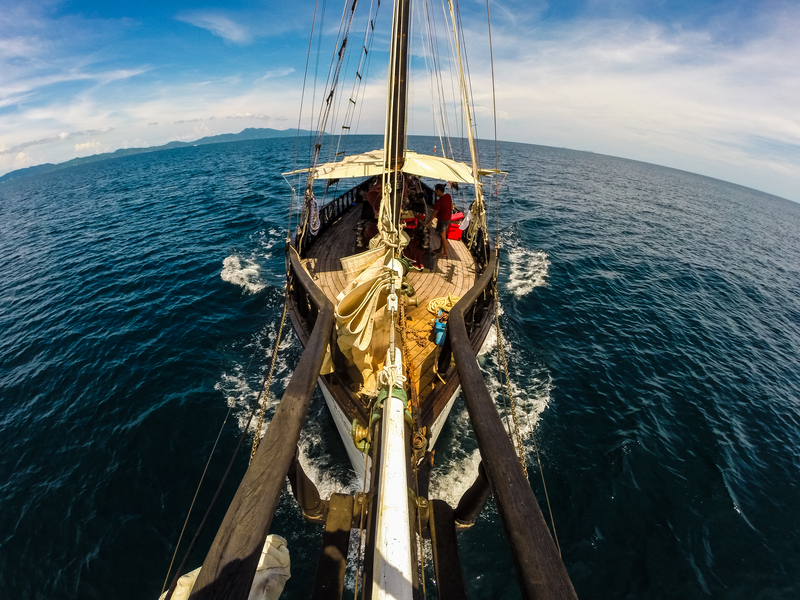 Come to see the true and beautiful Thailand from a deck of beautiful wooden Sailboat under command of one of the most experienced captains on the world. With over 50 years of experience, numerous ocean crossing and two round the world trips You can be sure that You are in the best hands while on board.